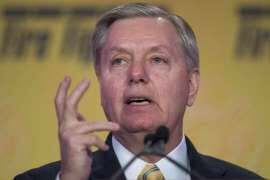 As you may or may not know, US Senator Lindsey Graham (R-GA or SC, like it makes a difference) is currently considering a run for President. In pursuit of this delusion, he's been visiting places like Iowa and New Hampshire, which hold the first caucus and primary respectively. Well, yesterday, he spoke at a "politics and pies" event (no, really) in New Hampshire, where he told the assembled masses that he would deploy the US military against Congress if he had to, in order to make sure they couldn't leave town until all defense cuts were restored.